Local residents were invited to buy shares in the proposed hotel and in less than two weeks 690 purchasers had invested over $450,000. With an additional $300,000 in mortgage money, the project was underway. It was designed by architect Charles W. Nicol, who was based in Lafayette, Indiana, and Chicago, Illinois. The hotel ultimately cost about $800,000. The general building contract was awarded to the Fleischer Engineering & Construction Company of Minneapolis, but local companies got a lion’s share of the sub-contracts as outlined in the newspaper article. The brick was furnished by the Rock Island Sand & Gravel company; the tile and terrazzo work by the Cassini Mosaic & Tile Company of Rock Island; the sand and gravel by the Rock Island Sand & Gravel company; the steel by the Rock Island Bridge & Iron Works; the millwork by the Rock Island Sash & Door Works and the Rock Island Woodworks; and the cement by the Rock Island Lumber company. Three elevators, two passenger and one freight, were furnished by the Montgomery Elevator Company of Moline. The nine-story hotel designed by Chicago architect Charles W. Nichol is Italian Renaissance in style and was completed in 1926, when the Argus noted that “A crowd estimated at 10,000 looked through the beautiful new Fort Armstrong Hotel from basement to 9th floor at a public inspection.” The first and second stories form a large square covering the entire building site. The seven upper stories form a cross with four wings extending from the center, giving every room an outside exposure. The building is constructed of red pressed brick and the first floor is faced with Bedford stone. Terra cotta detailing adorns the entire structure. The interior featured a grand two-story lobby with terrazzo floors and marble trimmings. Sharing the first floor were a coffee shop, dining room, private meeting rooms, offices and seven retail shops. The mezzanine featured three additional dining rooms, a banquet hall and an impressive ballroom. Tucked into the basement, along with the heating plant and coal room, were a barbershop, billiard room and bowling alley. The upper floors contained 160 guest rooms and the building was topped with ten apartments. 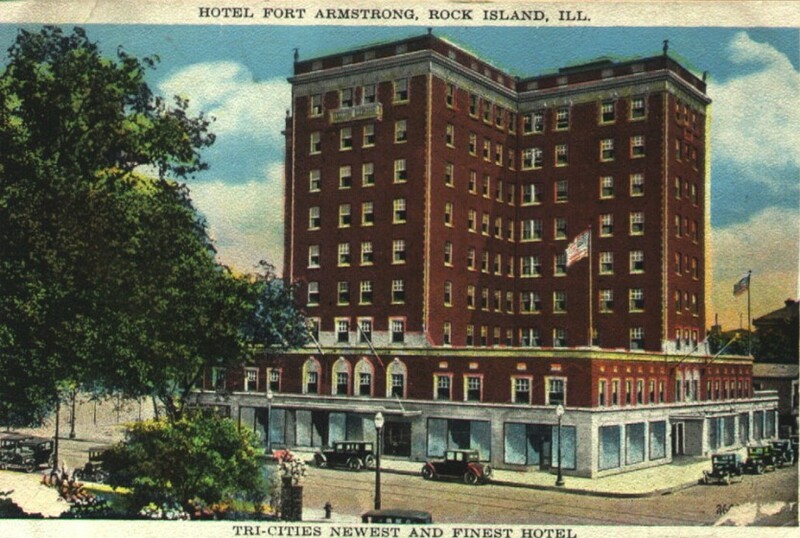 Today the Fort Armstrong is listed on the National Register of Historic Places. It has been restored and is operated as an assisted living facility. In addition, it offers banquet and meeting rooms open to the public and visitors are always welcome to stroll through the grand lobby and experience the elegance of a 1920’s hotel.